Over the past few years, river cruising has become very popular. River cruising offers you a completely different experience when compared to the big ocean liners. 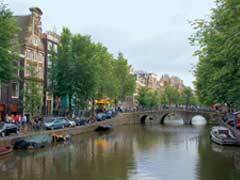 Consider a river cruise on your next trip to Europe, Russia, China, Southeast Asia or the Mississippi. Discover the unique differences for yourself. 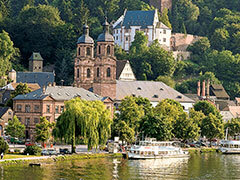 Departures works with all the river cruise lines to find the right river cruise for you. We strongly suggest if a river cruise is in your future, you contact Departures as soon as possible. Many of the ships book up 12 to 16 months in advance. Check out the top 10 reasons to go on a river cruise according to USA Today. 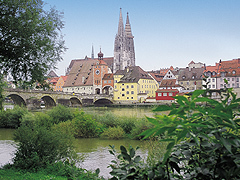 River cruises get you to inland Bucket List places including such cities as Vienna and Budapest. Cruises on the Danube and Rhine continue to be the epicenter of the industry, but that’s just the beginning of where you can go. Popular destinations include Russia’s Volga, China’s Yangtze, the Mekong and the Mississippi. All the rage is cruising in Myanmar — with companies including Grand Circle and Orient Express. France is getting new attention, especially Bordeaux where several lines have expanded offerings. River cruises are not about rushing here and there. You visit key sights but there is also time to relax. You can sit under a canopy on the open deck — or on some ships soak in a hot tub or pool — while catching river views that include (depending on where you cruise) castles, farms, kids swimming, fishermen and maybe a water buffalo or two. The size of river ships is limited by the need for the vessels to go through locks and under low bridges. Most carry fewer than 200 passengers, some fewer than 100 and some fewer than 50. The small-ship experience brings opportunity to get to know your fellow passengers — including at open-seating meals. There’s no dealing with crowds. Your ship ties up right in town and you can walk to a sidewalk café or shops or markets (including Northern Europe’s popular Christmas markets) and mingle with locals or head off on the ship’s organized tours to museums, monuments and other must-see attractions. 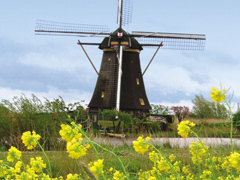 There is time to bike or hike and visit the places you came to see, and to absorb the local culture. There was a time when cabins on river ships meant a choice between tight and cozy. Today’s choices include cabins with step-out balconies, French balconies, walls of glass that open and even suites. Beds are hotel-like, bathrooms comfortably-sized and amenities include flat-screen TVs. The newest ships offer surprisingly hip, contemporary environments. While space is limited, the lines have gotten clever with public rooms including adding alternative al fresco dining venues. Lounges are comfortably, and sometimes even opulently furnished. Libraries offer a quiet spot to sit with a book. Open decks afford space to hang out in the sun or shade and such extras as golf-putting greens. There is opportunity shipboard to snack on knackwurst and drink local beer as you cruise past Germany’s castles, drink the wine in Bordeaux and try other local flavors depending on your itinerary. Culture comes onboard, too, in the form of local folk groups and other performers. Shore excursions, wine and beer with dinner (and sometimes also lunch), soda, bottled water, and specialty coffee drinks are all included in the cruise fare. Sometimes there’s also an open bar. Bonus: internet is free. Don’t pack the tux. River cruising is casual dress at all times. Plus you only have to unpack once. Most river ships market to an age 55-plus demographic, though travelers in their 40s would feel right at home — particularly on the newer, more contemporary river ships. Kids are a rarity. HOW ABOUT A CRUISE DOWN THE MIGHTY MISSISSIPPI? Beneath Queen of the Mississippi’s gleaming woodwork and polished brass is a framework of modern technology that provides passengers the most enjoyable Mississippi River cruise imaginable as our all-American crew delivers the personalized service that is the hallmark of American Cruise Lines. Check out this short video on American Cruise Lines and then call Departures to book your dream river cruise. 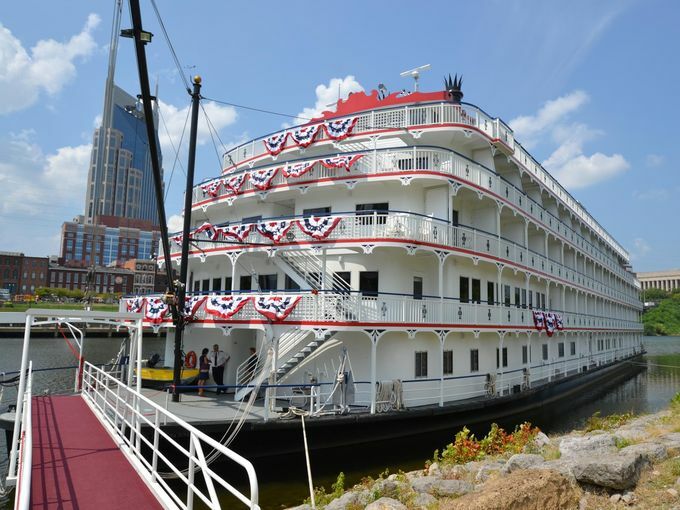 The newest river ship on America’s waterways is American Cruise Lines’ 150-passenger Queen of the Mississippi. Another option is the American Queen Steamboat Company which is debuting a sternwheeler on the Columbia & Snake rivers in the Pacific Northwest in addition to its cruises on the Mississippi. Contact Departures Travel to find out which river cruise option is best for you.